This marble marker looks like a lectern with a closed book on it. A closed book is often thought to represent the Book of Life. 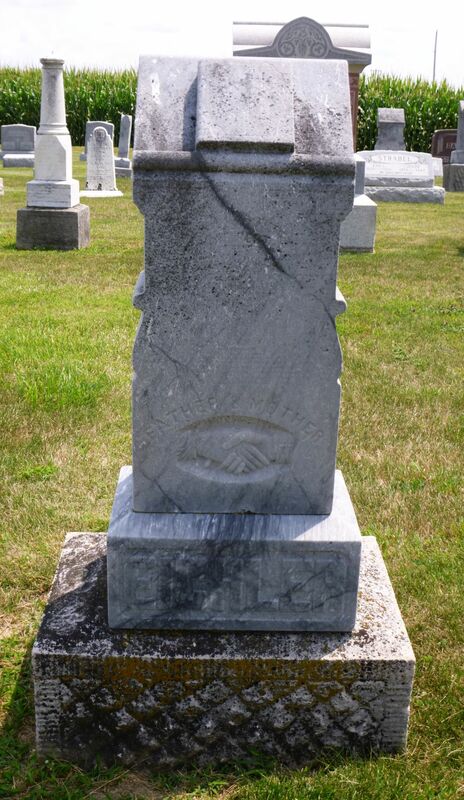 On the front of the tombstone are two clasped hands, one with a feminine cuff and the other with a masculine cuff, symbolizing marriage. Father & Mother is inscribed above the hands. 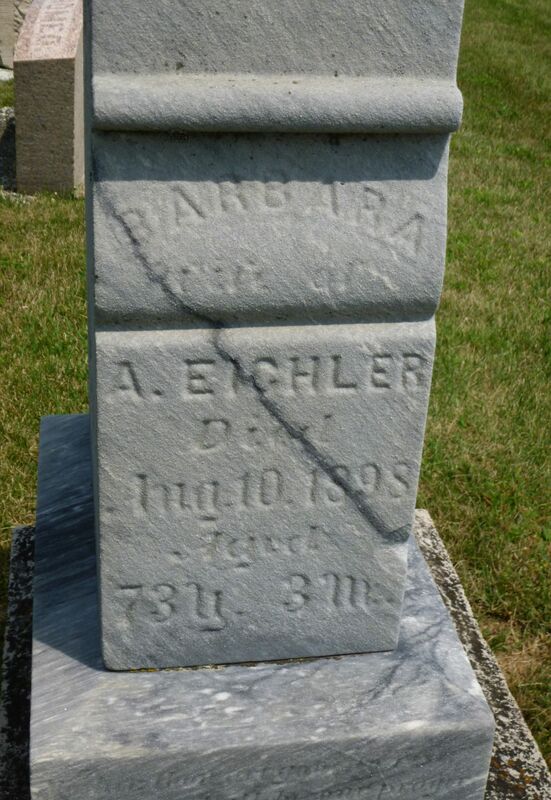 Andrew Eichler was born 2 September 1818 in Zweifelsheim, Bavaria, according to Zion Chatt’s records. His wife Barbara (Eichler) Eichler was born 10 May 1825 in Bavaria. 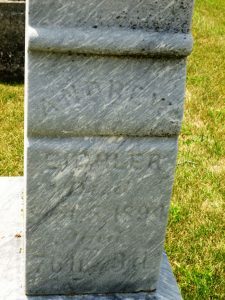 Both of their birth dates are calculated from their tombstone inscription but Zion Chatt’s records give Barbara’s date of birth as 11 May 1825. The Eichlers moved to Mercer County, Ohio, sometime between 1870 and 1880 and were enumerated in Blackcreek Township in 1880: Andrew, 61; Barbra, 55; Andrew, 21; Anna C, 23; Jacob, 19; Laurence, 17; Christopher, 14; Peter, 10. Andrew continued to farm in Mercer County. Andrew owned 160 acres of land in Section 20 of Blackcreek Township, along Wilson Road, east of what is now State Route 49. 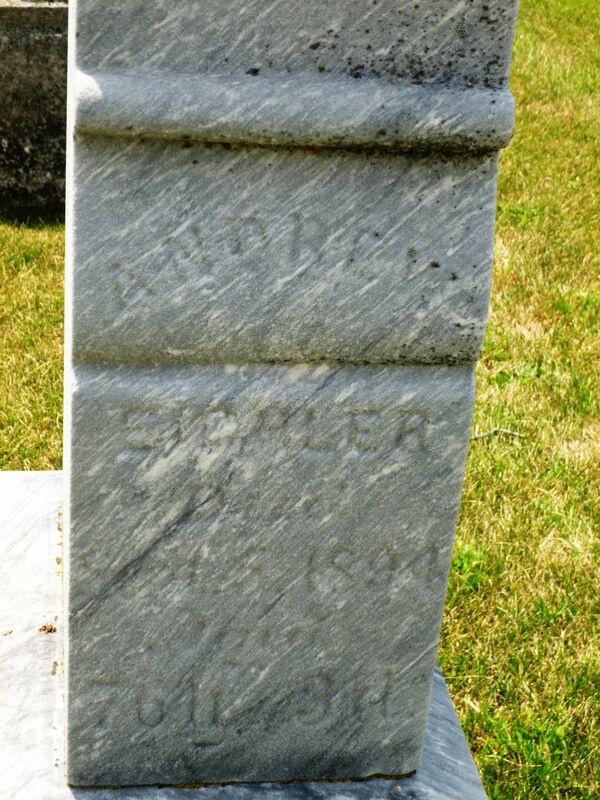 Barbara Eichler died of cancer and old age on 10 August 1898, at the age of 73 years and 3 months. She was survived by 10 children and 15 grandchildren, according to Zion Chatt’s records. “Ohio, County Marriages, 1789-2013,” Family.Search.org, Andrew Eichler and Barbara Eichler, 11 Dec 1847; Butler Marriages, Vol. 3, p.37; FHL microfilm 355779. 1860 U.S. Census, Hanover, Butler, Ohio, p.343, dwelling & family 311, Andy Eygler; Ancestry.com; FHL microfilm 803940, NARA microfilm M653, roll 940. 1870 U.S. census, Madison, Butler, Ohio, p.279A, dwelling 49, family 47, Andrew Igler; Ancestry.com; FHL microfilm 552676, NARA microfilm M593, roll 1177. 1880 U.S. Census, Black Creek, Mercer, Ohio, Ed 179, p.327B, line 8, Andrew Eichler; Ancestry.com; FHL microfilm 1255048, NARA microfilm T9, roll 1048. 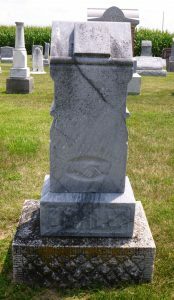 Mercer County, Ohio, Deaths, Vol. 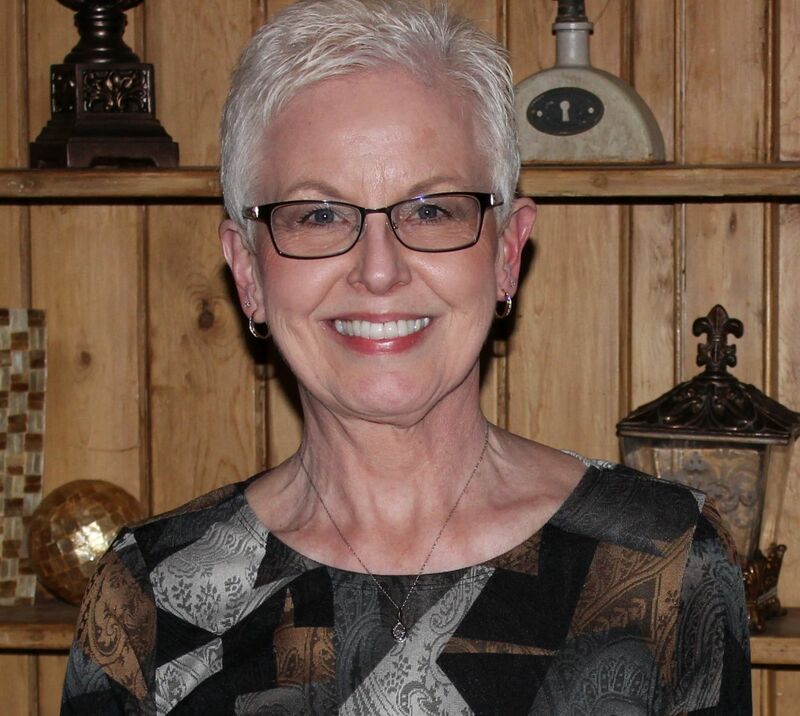 1,2; FamilySearch.org, no page; FHL microfilm 914954.